- Modular designed Aluminum alloy arch, easy to assemble and disassemble. - Outside Tension Adjustment: it is easy to adjust the tension via Tension Knob. - Automatic positioning and re-try functions: to secure the strap goes to its' proper position and every cycle is accurate and efficient. - Controlled by P.C. Board with multiple functions. 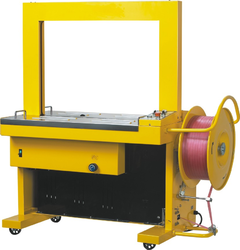 Leading Manufacturer and Exporter of Automatic Strapping Rolls. Note: All Equipment can be customised as per requirement. 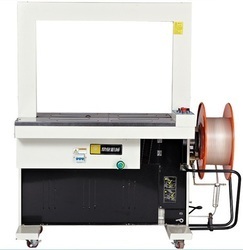 Fully Automatic Strapping Machine with free rollers as well as Automatic Conveyors. Made in Taiwan. Better performance than local/china make. 25 straps/min speed of strapping. Features: Noiseless,easy loading strap,heavy duty heater, rugged construction for continues duty etc.